The SMS Inbox component is only available in version 4.4 and greater of the Twilio for Salesforce package. The SMS Inbox component allows users to see messages from all of the leads and contacts that they own. Instead of visiting a contact or lead record to view recent messages, you can configure the SMS Inbox in the lightning toolbar or on a dashboard for easy viewing. Here, you can either add SMS Inbox to an existing lightning app, or create a new one. To create a new app, click "New Lightning App" in the top right corner. 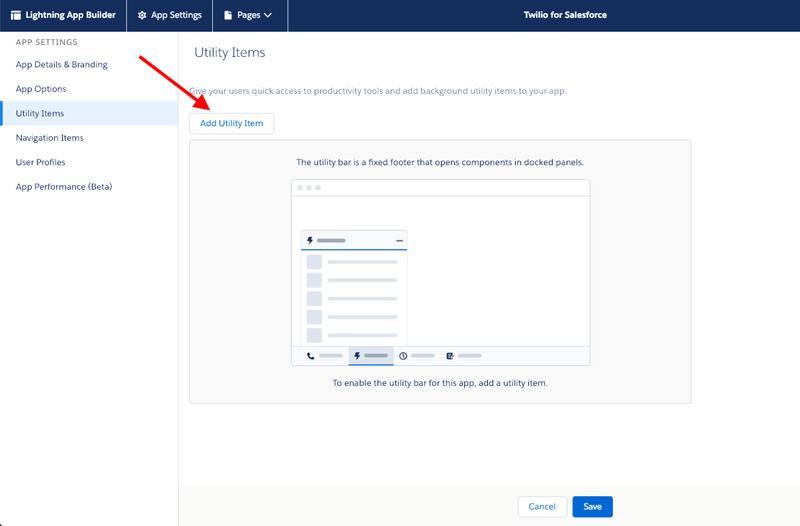 To add to an existing app, click on the down arrow at the right side of the app's row and select "Edit"
Once inside the Lightning App Builder, click on "Utility Items" in the side nav. 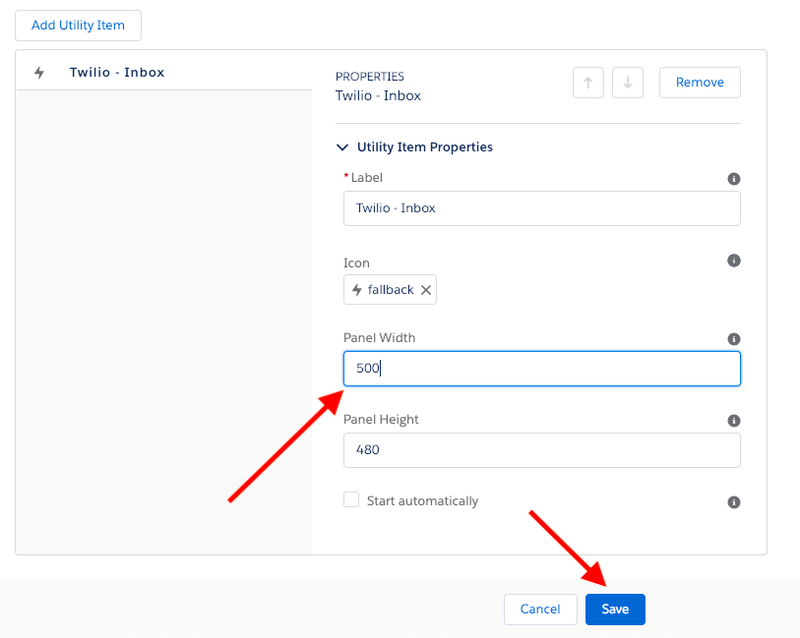 Click on "Add Utility Item" and select "Twilio - Inbox"
To optimize readability, set the component width to 500 pixels in the utility item configuration screen. Once you've set the component width, click the blue "Save" button. Launch your lightning app and be sure to refresh. Twilio - Inbox should now appear in your utility bar. Which messages appear in the Twilio for Salesforce SMS Inbox? 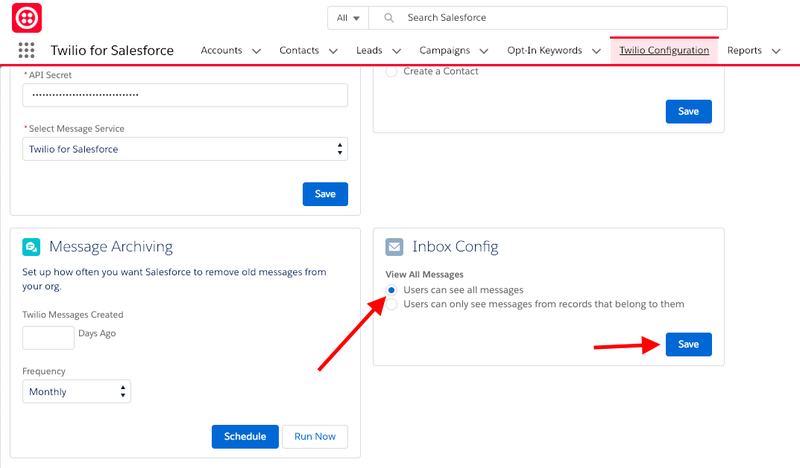 By default, the SMS Inbox will only show messages from Contacts, Leads, and Person Accounts that belong to the Salesforce user. Currently, Twilio for Salesforce does not support alternative workflows for routing SMS to Salesforce users. Twilio for Salesforce allows users to see all messages for their organization. This is useful if you have Salesforce users who frequently collaborate across conversations. This option must be enabled by an administrator on the "Twilio Configuration" page. Under the "Inbox Config" section, select "Users can see all messages" and then click the blue "Save" button. Once enabled, SMS Inbox users will see a checkbox in the top-right corner of the inbox that says "View All". 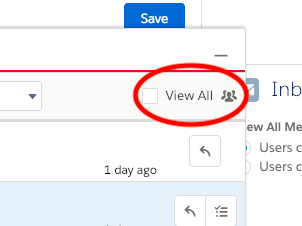 When selected, the inbox will display all messages for all conversations in the organization.